The proper use and tension of the hands and wrists during the golf swing confounds many a player. Though your instincts may tell you that maintaining a tight grip on the club with firm wrists is necessary to generate a powerful swing, the opposite is true. A loose, comfortable grip with relaxed wrists will help you make solid, powerful shots. The role of hands in the golf swing begins with grip pressure. One the most common mistakes beginners make is gripping the club too tightly. Such a grip makes executing a technically proficient swing very difficult. As Jim Miller Golf notes, grip a club as lightly as possible while still maintaining control of the club. Newer players are frequently surprised by just how loosely they can grip the club and still keep hold of it through the swing. When the grip pressure is sufficiently light, it's difficult to keep the wrists tense. However, consider the challenge of executing a golf swing with wrists that are not supple. Ben Hogan writes that the hands and wrists must release through contact; however, excess tension in the wrists prevents this from happening naturally. One common cause of tightness in the wrists is the tendency of players wanting to control the golf club up to the point of contact. The range of motion covered in a golf swing requires loose hands and wrists not only for the sake of getting the club into the proper position, but also for creating adequate club head speed. Club head speed is the most significant factor behind generating power and gaining distance. The fluidity necessary in the body for club head speed, according to Jim Miller Golf, begins with a loose and supple set of hands and wrists. 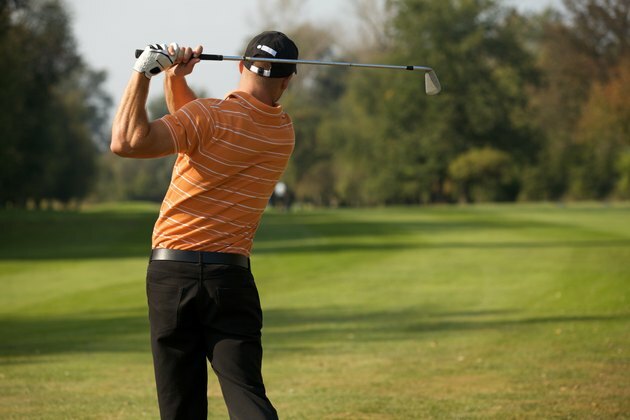 It's not uncommon for golfers to begin their swing with loose hands and wrists only to tighten them either at the top of the swing or as they brace for contact. Consequently, as part of the fluidity that Jim Miller Golf heralds, players must learn how to maintain this lack of tension all the way through the swing. It's not as easy as it sounds and you may find it difficult to accomplish at first. With practice, however, your body will learn to trust the loose approach and allow itself to remain this way during the entire swing.